Should You Pack a Tarp or Tent for Your Survival Bag? Some people like those over at Wilderness College would also add “attitude” to the list, and some people will put water as the #1 need in certain climates. But it goes without debate that shelter is incredibly important for survival, which is where the tarp or the tent come in. I’ve gone camping and done some survival simulations (aka drills) using both a tent and a tarp. Here is my thoughts on the matter. 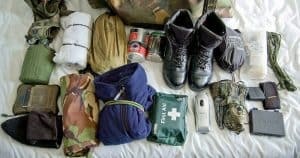 *Just in case you don’t have your bag packed yet, here is a Complete 3-Day Bug Out Bag checklist. Better Protection: There are lots of different ways to put up a tarp shelter, but none of them are as good as the all-around protection that a (quality) tent provides. A good waterproof tent will protect you from all sides. And, if you’ve chosen a tent with a high hydrostatic rating, it will also do a good job of trapping your body heat inside. Faster to Put Up: There are some tarp setups which provide just as much protection as a tent, but you’ll have to add some branches, leaves, etc. In other words, it takes a long time to get good protection! 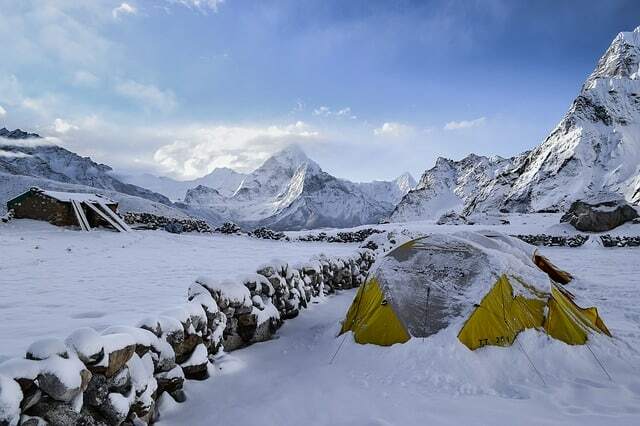 By contrast, a tent can be put up in a matter of minutes. Protection Against Bears and Animals: A thin nylon tent obviously won’t stop a bear. However, the tent does provide a psychological barrier against bears and other animals because they won’t attack what they can’t see. You’ll hear lots of stories from campers who heard bears sniffing around the tents but didn’t go in. 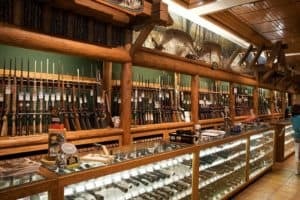 An open tarp shelter will not provide this protection. Heavy and Bulky: There are lots of great lightweight tents out there, but none of them are as compact as a tarp is. 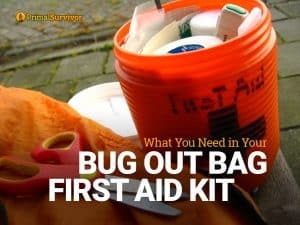 Plus, tents don’t really serve any other survival purpose so that’s a lot of space being taken up in your Bug Out Bag! Expensive: If you are prepping on a budget, then buying a quality tent can really make a dent in your funds. And there is no point in buying a tent if you aren’t going to buy a quality one that can withstand rain, winds, and other severe outdoor conditions. Lightweight and Compact: For one person, a tarp for a survival shelter should be at least 7′ x 10′ or 8′ x 10′. For multiple people, you’ll want to go with at least 10’ x 12’. Even a larger tarp than this will still be more compact and lighter than a tent. Versatile: There are lots of survival uses for a tarp which range from collecting rainwater to creating animal traps. When you are limited to how many items you can bring in your survival bag, versatility really matters! Really Cheap: Tarp materials like Tyvek and visqueen are ridiculously cheap (probably around $5-$10) and you might even be able to get them for free from contractors. Learn more about tarp materials and types here. 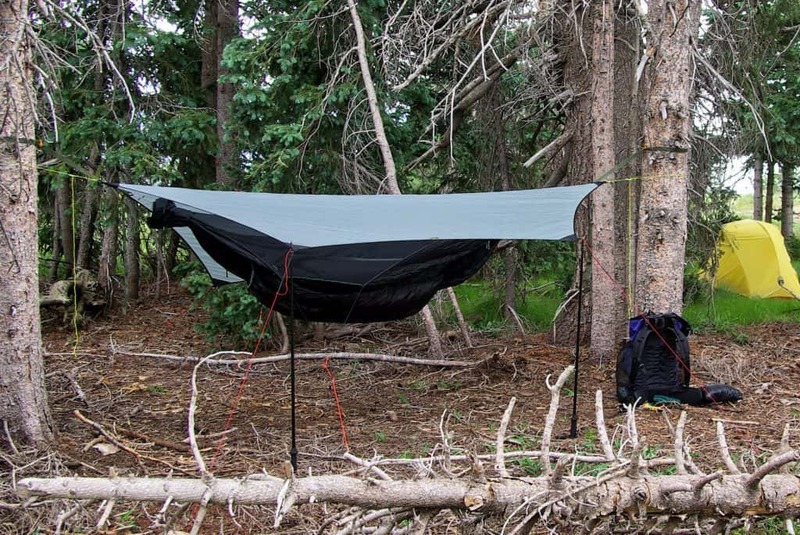 Get Above Ground: If you know what you are doing, you can string a tarp into a hammock. This will keep you off the cold ground and away from some pesky critters. You Can Build a Fire: Tents are enclosed structures and you can NOT build a fire in one or even near the door. By contrast, (with some tarp shelter designs) you can make a fire in front of or even within the shelter for warmth. When rigged right, the tarp shelter will reflect the heat from the fire to keep you warm. No Insulating Floor: If your tarp is large enough, then you can choose to use a shelter design in which the tarp covers the ground. Even with this setup though, you’ll still be on the ground. If it is wet, your body will feel it! There is also a good chance that your sleeping bag will get wet, which could result in hypothermia and death!!! Bugs Crawling On You At Night: I don’t really mind the bugs so much anymore, but rolling over onto slugs at night is definitely not pleasant! Oh, and there was that time I woke up after a night in a tarp shelter with mosquito bites on my EYELID. I could barely open my eye! Yeah, the bug issue is definitely a downside about choosing a tarp for your survival shelter. Higher Learning Curve: Don’t rely on a tarp as your survival shelter unless you’ve actually tested it out a few times. Looking at survival shelter designs online is one thing, but going out into the wilderness and trying them is completely different – especially should you need it on a cold, rainy day! For survival needs, tarps definitely are better than tents. However, choosing a tarp for your survival shelter is only wise if you know how to use it! That not only means knowing how to set up the tarp shelter, but being aware of the terrain and ground so you don’t end up wet and hypothermic. So, tarps are definitely not for newbies! 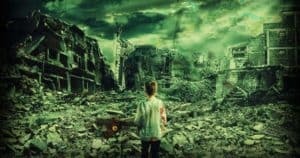 If you are new to survivalism, go find an expert or survivalist group to show you how it is done. Even if you are comfortable with using tarps for a survival shelter, it doesn’t mean you have to choose one. I’ve got a family of three. 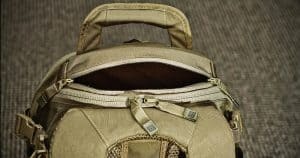 We each – including my 5 year old daughter – have our own Bug Out Bags (read how to build a family Bug Out Bag here). Because my wife and I are sharing the load, we have a tarp and a tent between us. One bag has the tarp. The other bag has the tent. If necessary, we could ditch the bag with the tent and still be okay with the tarp. This is what works for our family. You might take a completely different stance! There is no one right way to prepare for disaster!!! Learn to Make Natural-Material Survival Shelters! It is great to plan ahead and have a tarp or tent in your survival bag. But what if your survival bag gets lost or stolen? No gear can compensate for knowledge, which is why it is important to learn how to make survival shelters without any gear. So start practicing how to make brush shelters, snow shelters, fallen tree shelters, and leaf shelters. You can never be too prepared! What’s your stance on the tarp vs. tent debate? Which do you prefer and why? Let us know in the comments. I second the tarp. 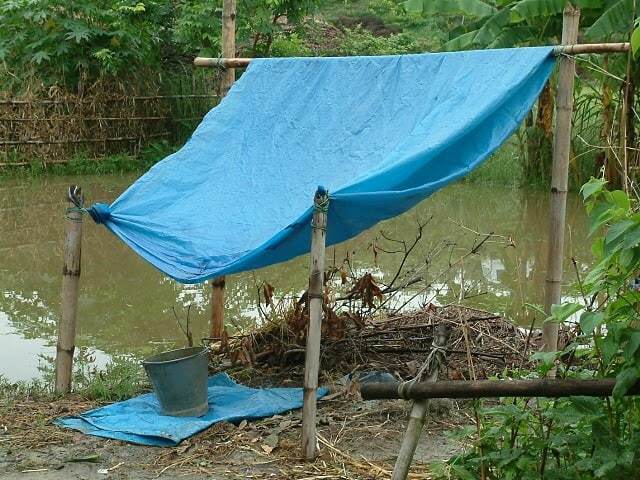 A tarp made out of gore-tex or similar material is good if you can afford it. A vapor permeable membrane means you can make your tarp into a “burrito” when its cold out and not get too wet from sweat and breath. 2 things I always carry when I’m using just a tarp are a bug headnet, and about of 2′ of light chain with an S hook one one end, and a quick link on the other. The headset is obvious, and it means I don’t have to wrap up to avoid the bugs when it’s warm. The chain, hook, and quick link is for pitching so I can quickly tighten the roof peak line if is starts to rain or blow. If you do it right, your set up will also allow you to hang a billy can over the fire at the end of your tarp. Just don’t get the fire too close to the tarp. Really good stuff misneac – thanks for your input.